More Advantages of Plastic / Polyethylene Boats Very Low Maintenance!! 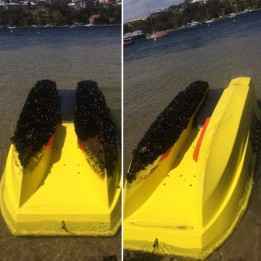 home | News | More Advantages of Plastic / Polyethylene Boats Very Low Maintenance!! Apart from the inherent indestructible nature of a polyethylene boat – there are many more advantages including the fact that they are very low maintenance (which we all like). Any unlikely problems that occur with the material can be fixed with plastic welding and soapy water and the very occasional scrub will be all you need to keep it looking great! Take this FINN Spindrift as an example. After 12 months of leaving this little gem unattended on a mooring in the middle of the river, some mussels had decided to adopt the hull as their home! Some scraping with a plastic paddle and they all came off easily with the hull completely undamaged underneath. No need for chemicals or power tools!!! (plus some mussels to take home for dinner). Contact us today to find out more reasons why a polyethylene boat is a clever idea including excellent buoyancy, stability, soft ride and durability.